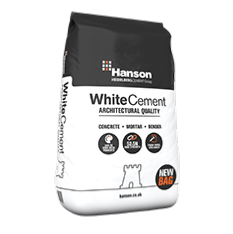 Suitable for general purpose concrete, mortar, render and screed. Hanson White Portland Cement is naturally chosen for its high degree of light reflection. To obtain white or light coloured concrete specially selected white or light coloured sand and stone aggregates are required. Coloured concretes and renders are achieved by adding pigments specifically designed for the use with Portland cement and Portland cement products. For extremely white concrete the white pigment Titanium Dioxide may be added in amounts of up to 5% by weight.